This is actually the UK trailer, but the US one was abysmal (seriously), so a tip of the hat to the amazing book trailer makers at Walker Books UK, our neighbors across the pond! The lovely Jennifer Ehle may be known to many of BBC you as the Lizzie Bennett in the BBC adaptation of Jane Austen's Pride & Prejudice (also starring Colin Firth -and his wet shirt- as Mr. Darcy). Ehle has made quite a name for herself since that 1995 production, starring in movies such as Contagion, The King's Speech, The Ides of March and Zero Dark Thirty. Clockwork Angel is the first book in Cassandra Clare's Mortal Instruments spinoff: The Infernal Devices series. 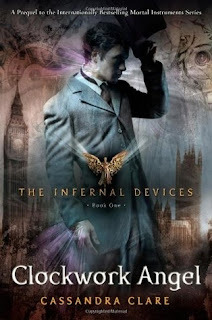 Call it blasphemy, but (having read the current entirety of both series) I think The Infernal Devices is considerably better than its already awesome predecessor. Do not fret if you haven't read the Mortal Instruments series yet, Clockwork Angel is set a hundred years before the City of Bones and the series absolutely can stand on its own. The characters are better developed and infinitely more clever and snarky (which I love). Where Jace came off a little pouty for my tastes (in City of Bones, etc.) somehow Will pulls the same sentiment off with less churlishness and more aplomb! Fans of the earlier series will be delighted to see some of their faves make cameos in this series (such as Magnus Bane!). As the Infernal Devices series progresses, it is interesting to see where plans are laid that impact the present Shadowhunter world and Easter Eggs abound for die hard fans of Clare's work. So, the story goes, that our heroine, Tessa Gray, comes to London from America at her brother's request after the death of their guardian Aunt. Immediately upon arrival, however, Tessa is Shanghaied and introduced to the dark secrets of Downworld. She has powers of her own and is thrust into plots, plans and manipulations that she would have never suspected existed in her previous life. Along the way, she meets the Shadowhunters at the London Institute and becomes a part of the family, fighting for good. No supernatural YA novel worth its salt would dare show its cover without including a love triangle, so naturally, we are treated to one in Clockwork Angel. While this device generally annoys me, in this instance (and in the subsequent novels) the triangle is natural, touching and (spoiler alert) eventually heartbreaking. Jennifer Ehle has been one of my favorite actresses since her turn as Miss Elizabeth Bennett in the BBC version of Austen's Pride & Prejudice. As the sole narrator of the audio version of Clockwork Angel, Ehle puts her acting chops to work by playing all parts to great effect! Her wry sense of humor shines through while playing Will and she conveys a true sense of innocence and strength while portraying Tessa. I would highly recommend the audio version and it is one of my favorite audio adaptations of all time.